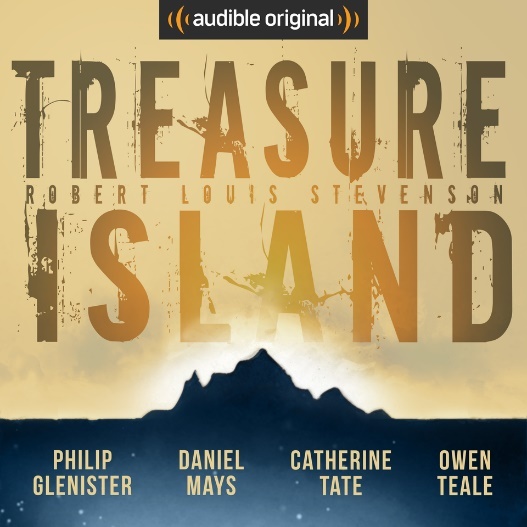 Just in time for the August bank holiday, Audible today debuts an all-star dramatisation of Robert Louis Stevenson’s much-loved classic, Treasure Island. One of the most enduring adventure tales of all time – immortalising the legacy of Blackbeard, Bartholomew Roberts and other real-world pirates through the fictionalised, parrot-adorned Long John Silver – this new production is sure to keep listeners entertained throughout long holiday journeys. Produced by Audible’s Grammy-award winning Audible Studios, Treasure Island features lead performances from Owen Teale (Game Of Thrones, The Last Legion), Catherine Tate (BAFTA-nominated, The Catherine Tate Show, The Office, Doctor Who), Daniel Mays (BAFTA-nominated, Line Of Duty, Atonement, Rogue One) and Philip Glenister (Outcast, Life On Mars) amongst others. Robert Louis Stevenson’s first critical and financial success, Treasure Island’s tale of “buccaneers and buried gold” established many of the pirate conventions we see in popular culture today – including maps marked with an “X”, schooners, the Black Spot, tropical islands, and one-legged seamen. With rich and detailed sound-design – including recordings of dinghies and wooden sailboats moored at London’s docklands and Greenwich pier; as well as original music from Denis King (composer of the Ivor Novello Award-winning Galloping Home for Black Beauty) – this new production transports listeners on a salty, seafaring voyage of discovery. Treasure Island is the latest release in a series of high-profile dramas from Audible Studios this year. Other titles released in 2017 include The X-Files: Cold Cases, starring Gillian Anderson and David Duchovny; Northanger Abbey, starring Emma Thompson, Lily Cole, Douglas Booth and Ella Purnell; and Alien: River Of Pain, starring Anna Friel, Colin Salmon and Alexander Siddig. Treasure Island is available to download now at www.audible.co.uk/treasureisland (one credit for Audible members, £14.99 for non-members or free with Audible’s 30-day trial). Jim’s parents are both honest innkeeper but his father dies in chapter 3. Left with the sole responsibility of running the Inn, Jim’s mother becomes intent on getting the money Billy Bones owes for his long stay at the inn. After he suddenly falls dead, it is she who insists on going through his sea chest. Without his mother, Jim would probably never have found the map that leads to his great adventure. The first-person point of view, of almost the entire novel. Jim is the son of an innkeeper near Bristol, England, and is probably in his early teens. He is eager and enthusiastic to go to sea and hunt for treasure. He is a modest narrator, never boasting of the remarkable courage and heroism he consistently displays. Jim is often impulsive and impetuous, but he exhibits increasing sensitivity and wisdom. The local doctor and magistrate. Dr. Livesey is wise and practical, and Jim respects but is not inspired by him. Some years previously, he had been in the British Army which fought (and lost) the 1745 Battle of Fontenoy. Livesey exhibits common sense and rational thought while on the island, and his idea to send Ben to spook the pirates reveals a deep understanding of human nature. He is fair-minded, magnanimously agreeing to treat the pirates with just as much care as his own wounded men. As his name suggests, Livesey represents the steady, modest virtues of everyday life rather than fantasy, dream, or adventure. The cook on the voyage to Treasure Island. Silver is the secret ringleader of the pirate band. His physical and emotional strength is impressive. Silver is deceitful and disloyal, greedy and visceral, and does not care about human relations. Yet he is always kind toward Jim and genuinely fond of the boy. Silver is a powerful mixture of charisma and self-destructiveness, individualism and recklessness. The one-legged Silver was based in part on Stevenson's friend and mentor William Ernest Henley. Ben Gunn is an ex-crewman of Captain Flint’s who has been marooned for three years on Treasure Island by his crewmates, after his failure to find the treasure without the map. During his time alone on the island, Gunn develops an obsessional craving for cheese. The captain of the voyage to Treasure Island. Captain Smollett is savvy and is rightly suspicious of the crew Trelawney has hired. Smollett is a real professional, taking his job seriously and displaying significant skill as a negotiator. Like Livesey, Smollett is too competent and reliable to be an inspirational figure for Jim’s teenage mind. Smollett believes in rules and does not like Jim’s disobedience; he even tells Jim that he never wishes to sail with him again. A local wealthy landowner; his name suggests in Cornwall (a traditional English rhyme states "By Tre Pol and Pen, Ye shall know all Cornishmen"). Trelawney arranges the voyage to the island to find the treasure. He is associated with civic authority and social power, as well as with the comforts of civilized country life (his name suggests both “trees” and “lawn”). Trelawney is excessively trustful as the ease with which the pirates trick him into hiring them as his crew demonstrates. The old seaman who resides at Jim’s parents’ inn. Billy, who used to be a member of Silver’s crew, is surly and rude. He hires Jim to be on the lookout for a one-legged man, thus involving the young Jim in the pirate life. Billy’s sea chest and treasure map set the whole adventure in motion. His gruff refusal to pay his hotel bills symbolizes the pirates’ general opposition to law, order, and civilization. His illness and his fondness for rum symbolize the weak and self-destructive aspects of the pirate lifestyle. He dies of a stroke as a result of a combination of drinking too much rum and the double shock of seeing Blind Pew and the realization that Long John Silver has tracked him down. An old sailor, calling himself “the captain” – Billy Bones – comes to lodge at the Admiral Benbow Inn on the English coast during the mid 1700s, paying the innkeeper's son, Jim Hawkins, a few pennies to keep a lookout for “seafaring men”. One of these shows up, frightening Billy (who drinks far too much rum) into a stroke, and Billy tells Jim that his former shipmates covet the contents of his sea chest. After a visit from another man, Billy has another stroke and dies; Jim and his mother (his father has died only a few days before) unlock the sea chest, finding some money, a journal, and a map. The local physician, Dr. Livesey, deduces that the map is of an island where the pirate Flint buried a vast treasure. The district squire, Trelawney, proposes buying a ship and going after the treasure, taking Livesey as ship's doctor and Jim as cabin boy. Several weeks later, Trelawney sends for Jim and Livesey and introduces them to Long John Silver, a Bristol tavern-keeper whom he has hired as ship's cook. They also meet Captain Smollett, who tells them that he does not like the crew or the voyage, which it seems everyone in Bristol knows is a search for treasure. After taking a few precautions, however, they set sail for the distant island. During the voyage the first mate, a drunkard, disappears overboard. And just before the island is sighted, Jim overhears Silver talking with two other crewmen and realizes that he and most of the others are pirates and have planned a mutiny. Jim tells the Captain, Trelawney, and Livesey, and they calculate that they will be seven to nineteen against the mutineers and must pretend not to suspect anything until the treasure is found, when they can surprise their adversaries. But after the ship is anchored, Silver and some of the others go ashore, and two men who refuse to join the mutiny are killed — one with so loud a scream that everyone realises there can be no more pretence. Jim has impulsively joined the shore party, and now in running away from them he encounters a half-crazy Englishman, Ben Gunn, who tells him he was marooned here and can help against the mutineers in return for passage home and part of the treasure. Meanwhile Smollett, Trelawney, and Livesey, along with Trelawney's three servants and one of the other hands, Abraham Gray, abandon the ship and come ashore to occupy a stockade. The men still on the ship, led by the coxswain Israel Hands, run up the pirate flag. One of Trelawney's servants and one of the pirates are killed in the fight to reach the stockade, and the ship's gun keeps up a barrage upon them, to no effect, until dark, when Jim finds the stockade and joins them. The next morning Silver appears under a flag of truce, offering terms that Captain Smollett refuses, and revealing that another pirate has been killed in the night (by Ben Gunn, Jim realizes, although Silver does not). At Smollett's refusal to surrender the map, Silver threatens an attack, and, within a short while, the attack on the stockade is launched. After a battle, the surviving mutineers retreat, having lost six men, but two more of the captain's group have been killed and Smollett himself is badly wounded. When Livesey leaves in search of Ben Gunn, Jim runs away without permission and finds Gunn's homemade boat. After dark, he goes out and cuts the ship adrift. The two pirates on board, Hands and O'Brien, interrupt their drunken quarrel to run on deck, but the ship — with Jim's boat in her wake — is swept out to sea on the ebb tide. Exhausted, Jim falls asleep in the boat and wakens the next morning, bobbing along on the west coast of the island, carried by a northerly current. Eventually, he encounters the ship, which seems deserted, but getting on board, he finds O'Brien dead and Hands badly wounded. He and Hands agree that they will beach the ship at an inlet on the northern coast of the island. But as the ship is finally beached, Hands attempts to kill Jim, and Jim shoots and kills him. Then, after securing the ship as well as he can, he goes back ashore and heads for the stockade. Once there, in utter darkness, he enters the blockhouse — to be greeted by Silver and the remaining five mutineers, who have somehow taken over the stockade in his absence. Silver and the others argue about whether to kill Jim, and Silver talks them down. He tells Jim that, when everyone found the ship was gone, the captain's party agreed to a treaty whereby they gave up the stockade and the map. In the morning Dr. Livesey arrives to treat the wounded and sick pirates, and tells Silver to look out for trouble when they find the site of the treasure. After he leaves, Silver and the others set out with the map, taking Jim along. Eventually they find the treasure cache — empty. Two of the pirates charge at Silver and Jim, but are shot down by Livesey, Gray, and Ben Gunn. The other three run away, and Livesey explains that Gunn has long ago found the treasure and taken it to his cave. In the next few days they load the treasure onto the ship, abandon the three remaining mutineers (with supplies and ammunition) and sail away. At their first port, where they will sign on more crew, Silver steals a bag of money and escapes. The rest sail back to Bristol and divide up the treasure. Jim says there is more left on the island, but he for one will not undertake another voyage to recover it. Audible, an Amazon.com, Inc. subsidiary (NASDAQ:AMZN), is the leading provider of premium digital spoken audio information and entertainment, offering customers a new way to enhance and enrich their lives every day. Audible was created to unleash the emotive music in language and the habituating power and utility of verbal expression. Audible content includes more than 250,000 audio programs from leading audiobook publishers, broadcasters, entertainers, magazine and newspaper publishers, and business information providers.